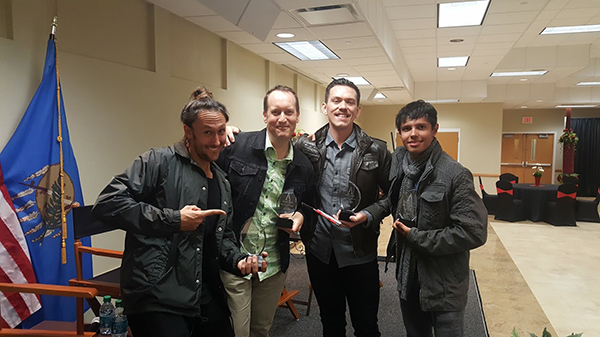 Alumnus Adam West (MFA, costume design), a 2004 graduate from the Department of Theatre, worked for four years on the hit MTV series Teen Wolf as its key costumer, managing costumes and costume special effects. West took time to share how Ohio State shaped his skillset and prepared him for his professional career. West currently serves as a field representative for Motion Picture Costumers, the International Alliance of Theatrical Stage Employees, Local 705. What made you choose The Ohio State University? I made it into several top-tier theatre design programs, and chose Ohio State specifically because of the superior level of practical experience I would get, as well as my impressions of the faculty and the way the current students spoke about the program during my interview. Every one of the theatre design professors were wonderful (Dennis Parker, Mark Shanda, Mary Tarantino and Dan Gray), but I was especially grateful for my advisor Kristine Kearney, who took over the costume design program when Dennis Parker retired halfway through my studies. Professor Kearney was such an excellent teacher and mentor and really defined my experience there. What were you involved in during your time with the Department of Theatre? I helped re-launch the theatrical makeup class, and served on the Department of Theatre's graduate student organization. I was given the Graduate Student Excellence in Teaching Award my final year and was also accepted into the prestigious USITT Young Designers Forum for 2004. I had many wonderful classes, but my favorite was a seminar in Cross-Dressing for the Stage taught by Lesley Ferris. It was an amazing cross-section of history, performance genres, gender studies and fashion, and Professor Ferris had a way of making every discussion fascinating. 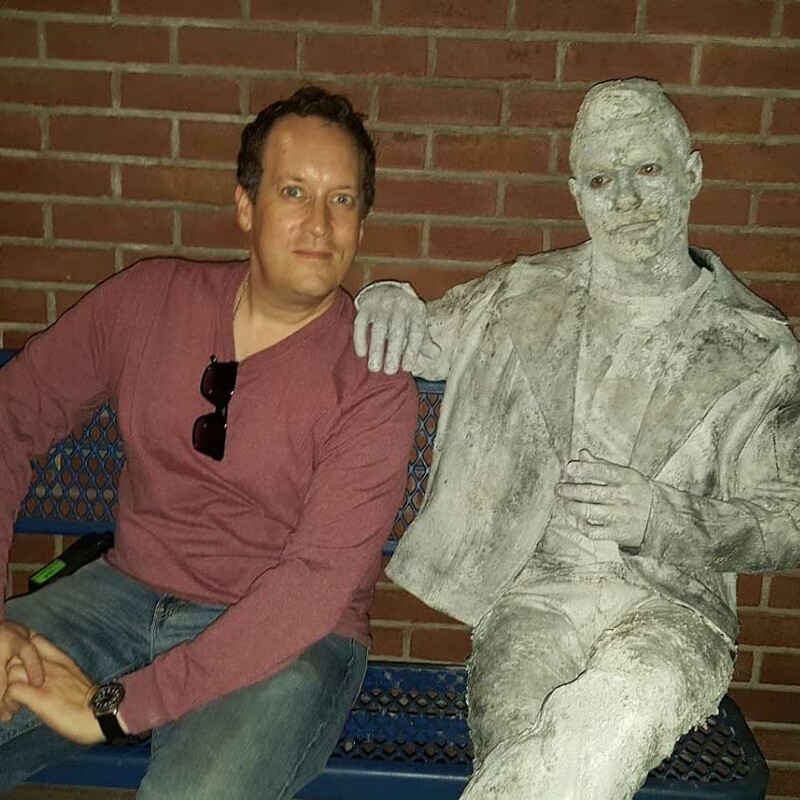 What was it like working on Teen Wolf? I tell people that Teen Wolf was the worst job I ever loved! It was grueling, intense and often thankless (even dangerous at times). The show was often dismissed as silly (and some parts definitely were! ), but it also was rooted in representing marginalized groups and teaching young people to accept themselves and others for who they are. Most of the actors and crew were like family. While most people over 25 had no idea it was even on the air, young people would just go insane for it and want to know everything about it. While it was some of the hardest years of my career, it was also some of the most rewarding. 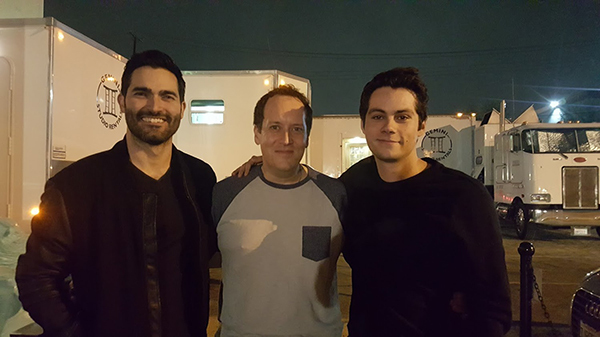 West (middle) with actors Tyler Hoechlin (L) and Dylan O'Brien (R), while filming the Teen Wolf series finale. What was your role on the show? I helped make monsters, set people on fire, throw gallons of fake blood around and turn people to stone. Skills I learned at Ohio State were used every day on that set, and I was highly valued for my ability to figure out any costume problem. For the finale, I had to develop a process to make several actors' clothes look like they've been turned to stone. The stone had to match their makeup and hair special effects, as well as be flexible enough that they could have movement. I used a mix of clay, acrylic paint and oatmeal to create the effect. I directly drew on skills I learned at Ohio State to develop this, having been thoroughly educated in how to manipulate fabric and work with a wide variety of materials to make special effects. How has your career path impacted other aspects of your life? Lowak Sho'li is a Chickasaw expression meaning "carry the fire" and it is the title of their yearly humanities panel providing arts and culture education. I am a member of the Choctaw tribe and a citizen of the Choctaw Nation of Oklahoma. I grew up in Ada, Oklahoma, which is actually part of the Chickasaw Nation (the two tribes are closely connected throughout history with similar language and culture), so I have strong ties to that tribe as well. They invited me and three other Native filmmakers with ties to the nation to give a panel on careers in filmmaking. I was there mostly to talk about working behind the scenes in Los Angeles and my experiences on popular TV shows. I also have taught a class on costumes for the Chickasaw Arts Academy program, guiding high school students through a weeklong intensive on costume design and production. Pictured left-right is Blake Pickens (Chickasaw), Adam West (Choctaw), Ezekiel Walker (Chickasaw), Micah Hart (Chickasaw) on the Lowak Sho'li panel. After teaching at SUNY Geneseo for several years, I moved to Los Angeles and began working as a costumer for film and television (eternally grateful for guidance from an Ohio State alum who helped me navigate getting in!). Through 10 years of working on sets and in costume rental houses, I had been highly involved in my union Motion Picture Costumers (IATSE Local 705). I have served on numerous committees (and have co-chaired four of those), and as a convention delegate for the last nine years. In August 2018 I was hired to serve as Field Representative for Motion Picture Costumers. My position now is to represent and support the members through understanding and explaining our contracts. It was my experience at Ohio State that helped me develop the discipline and habits of thorough research, careful analysis and speaking up for myself. The design faculty at Ohio State were professional and empowering, expecting a great deal from me, but also teaching me to command respect for my skills and expertise. This diligence prepared me to not only advocate for myself as a professional artist, but also to have the confidence and leadership skills to stand up for others.